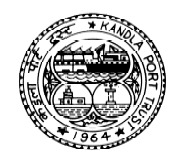 Kandla Port Trust (KPT) has published Advertisement for below mentioned Posts 2017. Other details like age limit, educational qualification, selection process, application fee and how to apply are given below. Educational Qualification: (I) Degree or equivalent in Civil Engg. from a recognized University / Institution. (II) Twelve years experience in executive cadre in Planning / Construction/ Design / Maintenance preferably of Port and Marine Structures in an Industrial / Commercial / Govt. Undertaking. 1. Attested copies of ACRs of the applicant for the last 5 years. 2. Attested copies of all certificates. 3. No Objection Certificate of respective Ports. 4. An undertaking of the applicant not to withdraw, if selected. Proforma prescribed by the Ministry (Annexure-III).